The MasterCare Integrity tub is a versatile system that can be used for daily hygiene for nearly all levels of care at your Elder Care or Resident Care community. It is a complete bathing system for all skills levels! The MasterCare Integrity Transporter can be used as a complete hygiene chair, in addition to being used in the Integrity bathing tub. The Transporter features a revolutionary tilt-in-space chair design. There is a peri area opening and the transporter fits over a standard toilet. 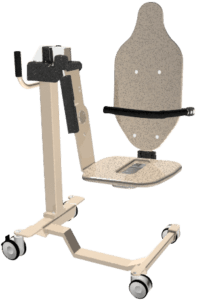 It comes standard with security belts, comfort pads, rated at 400 pounds; constructed of power-coated aluminum, gel coated fiberglass and composites – it is built for ease of maneuverability, cleaning and use! Available in white or tan. Contact us to transform hygiene at your elder & other care community with the Entrée spa tub. Fast fill reservoir, a scale (for the Transporter), FlushCare, 10 year parts warranty and multitude of color choices.